Polygala cruciata is a small, conspicuous plant that occurs primarily in the Atlantic and Gulf coastal plains but has scattered and infrequent occurrences inland. There is a discrete, secondary range in the Great Lakes region that is disjunct from the main range. This isolated range is likely a relict of a larger continuous range that existed shortly after deglaciation. Populations in the Great Lakes region have always been small and scattered, but have recently suffered significant declines resulting from habitat loss. In Minnesota, P. cruciata has a long collection history providing clear evidence of a decline. This species was documented seven times between 1885 and 1905; five times between 1905 and 1966; but only five times since 1966. Perhaps more revealing is that all the records since 1905 are from Anoka County. The species may now be extirpated from five of the six counties where it has been historically reported. Heavy development pressures in the northern suburbs of the Twin Cities metropolitan area and in rural areas of east-central Minnesota have nearly eliminated this species in the state. 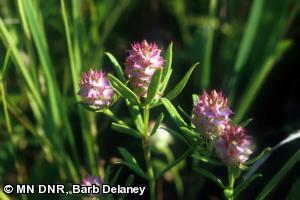 Polygala cruciata was listed as an endangered species in Minnesota in 1984. Polygala cruciata is a distinctive annual with purplish or pink flowers in a dense, spike-like raceme. The most prominent parts of each flower are not the petals, but actually a pair of deltoid, petaliferous sepals or wings. The bracts that subtend each flower persist as subulate hooks after the fruit has fallen. Only P. sanguinea (blood milkwort) bears any resemblance to this species, but it has alternate leaves, whereas P. cruciata has whorled leaves. Although they may occur in whorls of 3, the linear leaves of P. cruciata are more commonly 4-whorled, hence the species epithet that means cross-shaped (Gleason and Cronquist 1991). The Minnesota populations have occurred primarily on wet, sandy shores of shallow lakes in the Anoka Sand Plain, and in sandy or peaty meadows or swales. These habitats may be in low depressions or at the margins of emergent wetlands. Habitats are typically open and sunny with acidic soils and fluctuating water tables. Other rare species associated with these habitats include Rotala ramosior (tooth-cup), Scleria triglomerata (tall nut-rush), and Xyris torta (twisted yellow-eyed grass). Polygala cruciata is an annual that flowers in July and August, and possibly into September. Flowers are insect-pollinated and seeds are gravity-dispersed. The best time to search for P. cruciata is when in flower, during July and August. Polygala cruciata occurs in shallow groundwater-maintained wetlands, and formerly the sandy shores of small, groundwater-fed lakes and ponds. These habitats are very fragile and susceptible to any activity, such as ditching and tiling, which alters groundwater or surface water flow patterns. The habitats are also easily damaged by the invasion of non-native species such as Phalaris arundinacea (reed canary grass) and Lythrum salicaria (purple loosestrife). These habitats typically exist as isolated remnants less than 20 ha (50 ac.) in size, which makes them even more vulnerable (Kost 2000). One extant population occurs in Cedar Creek Natural History Area, which is managed for research purposes by the University of Minnesota. Another site near the city of Blaine is being considered as a potential state Scientific and Natural Area. Kost, M. A. 2000. Natural community abstract for coastal plain marsh. Michigan Natural Features Inventory, Lansing, Michigan. 5 pp.